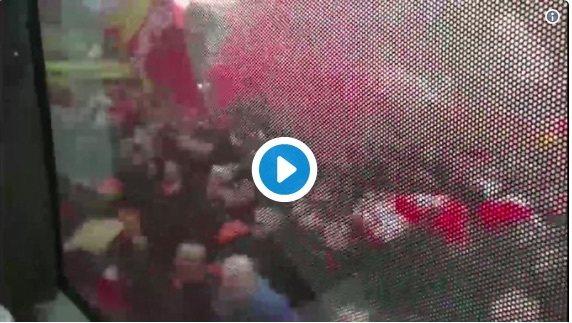 Bar the handful of supporters who let themselves down by throwing bottles at Manchester City’s bus, Liverpool’s fans did themselves absolutely proud last night and played a huge part in the win. If you think you’re in for a lucky day as well, enhance your odds with a Betfred promo code 2018. Thousands gathered on Arkles Lane and greeted the coaches as they arrived, before singing for 90 minutes straight inside the stadium. City’s players will claim it didn’t affect them; and that the noise of Anfield wasn’t a contributing factor – but we won 3-0 and the evidence is clear. James Milner, who was heroic in midfield, filmed from inside the bus as it pulled up outside the ground. We wish the windows were not tinted, but you can get a good idea of what’s going on outside! The aim was to inspire Liverpool and intimidate City – and it worked.